Ben, I wonder how much of this point loss is attributable to fragmentation? After all, there is a limited number of old media brands to compare to an ever-expanding universe of online-only brands. Are individual Web-only brands in each segment outpacing the traditionals? Steve, the answer differs depending on whether you include the News category. We looked only at properties with at least 500K uniques in each reporting period, and even with that higher threshold, certainly there was greater growth (+20%) in the number of new media properties v. old media (+5%). 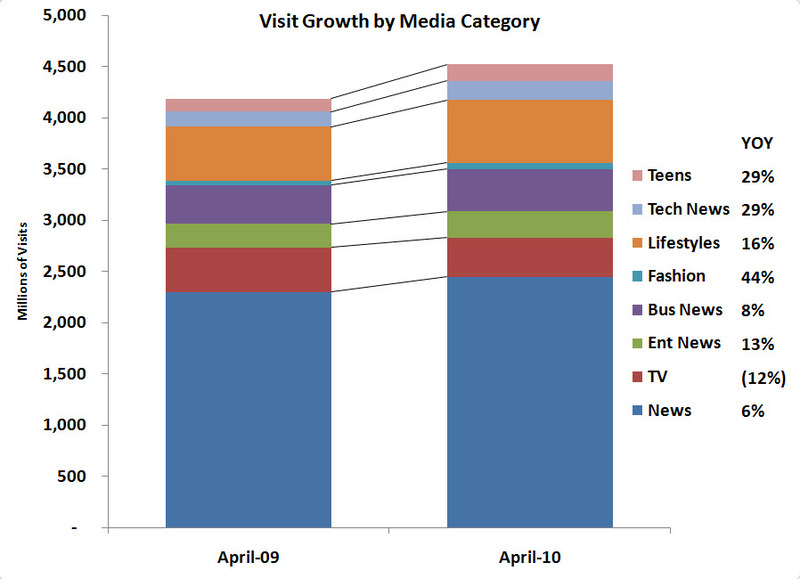 Still, looking only at properties that were big enough in both April 2009 and April 2010, there was still 5% growth in total visits for new media properties, similar to the 6% growth in old media. 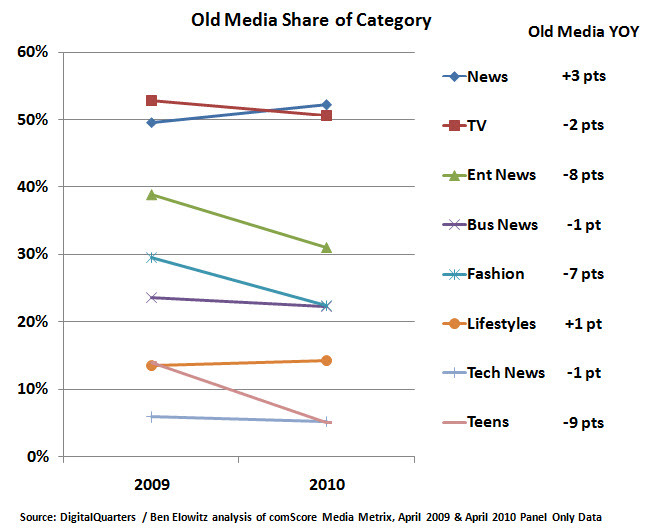 However, old media's growth is entirely due to News. Excluding the News category, the traditional magazine spaces are contracting for old media: for those properties that existed in April 2009 and April 2010, old media lost 2% of total visits. Whereas new media (still those entities that existed in both reporting periods) excluding News gained nearly 8% of total visits. Big brands should continue to drive market share as long as they're willing to spend as much time and money digitally as their new counterparts. The Perfect Market point of view makes a good distinction that strong traditional brands may be able to get a lot more bang for their buck, especially if they've already nurtured brand ubiquity in the real world. Excellently written article, if only all blogger offeredthe same level of content as you, the internet would be a much better place.Your graph really showed up that fashion is really growing up in brands and lifestyle.